Buy Five Tickets, Get One Free! The Coca-Cola Six-Pack is back! For a limited time when you buy five 4-day General Admission tickets with Camp Access, our friends at Coca-Cola are giving you the sixth ticket absolutely FREE. This offer won’t be around long, though, so get yours while you can! "The fact that you can see ALL of these amazing artists over four days for about the same price as one concert is a great deal! I can't wait to be at Country Jam again in 2019!" Q: I only want to come for one day. When will Single Day tickets be available? Q: What is included with each ticket type? Ages 10 and under do not require a ticket for General Admission areas. To enter the campgrounds you must choose the General Admission with Camp Access ticket type when purchasing. This is just access to the campgrounds and does NOT include a campsite. Campsites are sold separately. Access to festival grounds for all four days of music, Thursday through Sunday. Ability to enter campgrounds beginning Wednesday for campground party at Jack’s Place, and stay until Monday at noon. Must be a current student enrolled in any level or type of school (high school, college, vo-tech, etc.) with valid photo student ID to show at gate. This ticket type gives you the ability to enter the campgrounds. THIS DOES NOT INCLUDE A CAMPSITE. Campsites are sold separately. Your choice of an assigned seat in Sections 6-10. 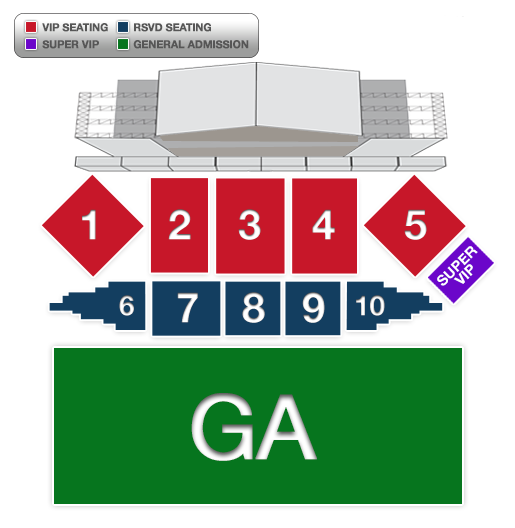 Click here to see the seating map. To enter the campgrounds you must choose the Reserved with Camp Access ticket type when purchasing. his is just access to the campgrounds and does NOT include a campsite. Campsites sold separately. Your choice of an assigned seat in Sections 1-5. Click here for the seating map. Access to VIP Hospitality area with event concierge, private flushable bathrooms and air- conditioned tent featuring complimentary soda, water, beer, and food (hard liquor complimentary after 6:00 PM). To enter the campgrounds you must choose the VIP with Camp Access ticket type when purchasing. This is just access to the campgrounds and does NOT include a campsite. Campsites are sold separately. These are just our tickets that grant you access to the festival grounds. To see our campsites, parking, and other items available please visit our ticketing page here. Q: Are ticket transfers allowed? Yes! If you wish to pay for your tickets in increments instead of all at once please choose the “Layaway Plan” option when checking out in your shopping cart. This will break your total cost into monthly payments lasting over 5 months. There will be a $10 fee added for using the payment plan, but no interest is accrued. All fees will be processed on your first payment. We offer West Weekend Parking passes that allow you to park in lots closest to the festival entrance. These passes are good for the entire weekend and can be purchased in advance. We also offer single day on-site parking in lots that are a little further away. Single day parking is available for purchase on-site only. Please note, cars in single day lots must be moved by 9:00 AM the next day or will be towed at the owner’s expense. VIP parking is free to all VIP ticket holders — just show your VIP wristband at the gate when entering. Tickets are on sale now. Visit our ticketing link here to purchase. Q: Do I need camp access? Anyone who would like to enter the campgrounds, even just to visit, must purchase an admission ticket WITH CAMP ACCESS.” When picking out your VIP and/or Reserved Seat make sure to choose “VIP seat with Camp Access” or “Reserved Seat with Camp Access” from the seat options. Q: Can I buy one ticket and give it to my friend the days I’m not attending? No tickets are non-transferrable. One ticket = one wristband = one person for the whole festival. Q: Do I need to buy camp access if I’m only attending one day? If you want to access the campgrounds, you must have a 4-day ticket with camp access. If you currently have a single day ticket and want to go into the campgrounds, you will need to upgrade to a 4-day ticket and purchase camp access. Single day ticket holders are not allowed into the campgrounds. Q: Can I buy tickets internationally? Q: I can’t go, can I give my tickets to a friend? Yes, but make sure your friend registers the wristband in their own name while activating it. If not and the wristband gets lost, there is no way to replace it – they would have to pay full price for a ticket since we have no way of tracking the order to their name. Q: What are the service charges? Service charges, shipping, and handling fees are not included in the base price of a ticket; these fees are added into your cart separately. If you choose to call one of our customer service representatives to place your order, you will see a $4 phone order fee added to your total at checkout. Q: Why am I getting an error message when purchasing? Q: What are the wristband policies? All admission tickets are mailed as wristbands to the address listed on your account, a few weeks before the event. Please make sure to keep your account shipping address updated. Do NOT put your wristband on before arriving to the event. Country Jam is not responsible for tampered or broken wristbands. Wristbands can be replaced at the event with proof of purchase and a valid photo ID matching the account and will be $30. Only tickets purchased through our Frontgate Ticketing platform are valid: see here. Country Jam is not responsible for lost, stolen, broken or tampered wristbands. Q: When will my wristband ship? You will receive your wristbands in your mailbox within 1-3 weeks before the festival. If you have not received your wristbands 72 hours prior to the festival, please email our customer service line at info@countryjam.com. Q: What are the box office hours? Box office hours will be determined and released closer to Country Jam 2019. They will be available in your Arrival Instructions that will be emailed to you within a couple weeks of the event. Q: Can I change my credit card on file for the layaway plan? Log in to your account at http://countryjam.frontgatetickets.com and you can update your payment information there. Q: Can I upgrade to VIP or add camp access? 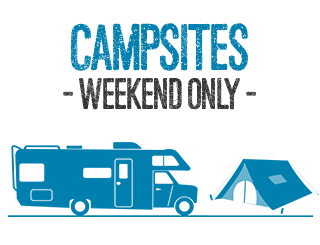 You can log in to your account at http://countryjam.frontgatetickets.com and change any information you need, such as your payment information, shipping address, etc. Children 10 years old and under are free for all General Admission festival areas and campgrounds. 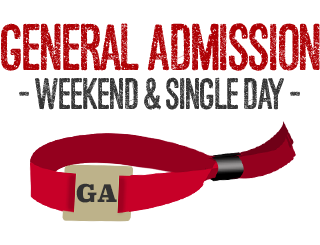 All ages require a ticket to enter the VIP, Super VIP, Reserved, Skybox, and Country Club areas. Q: Can I buy my tickets over the phone? Yes, you can call us at 855-821-9210 to purchase tickets over the phone. Please note there is a $4 service fee for all phone orders. Country Jam is a rain or shine event. No refunds or exchanges will be accepted. All items are subject to availability and prices can change without notice. Country Jam is an all ages event. Children 10 and under will be admitted free. Wristbands will be shipped to your door later in the spring. Once your order ships, you will be notified via email with a tracking number attached. All wristbands are mailed, there are no hard tickets and all sales are final – no exceptions. Do NOT remove your wristband and/or decal in between days. Do NOT put your wristband on prior to the festival or pull the black toggle. Country Jam will NOT replace these wristbands. Only tickets purchased through Country Jam & Front Gate ticketing are valid. Lost, stolen, broken, over-tightened, or tampered wristbands are void and Country Jam is not responsible for these wristbands. If you would like to upgrade your ticket to VIP, Reserve, or add camp access onto your ticket, please call us at 855-821-9210 to pay the difference of what the current market price ticket costs prior to your tickets being shipped. Once your order has shipped, you will need to purchase any upgrade at the event box office. 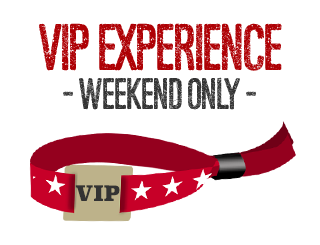 VIP: Assigned seating closest to the stage with access to unlimited food and beverage via our VIP Hospitality area and free parking. See full details on our VIP Experience page. Super VIP: Includes all VIP amenities along with access to the Super VIP lounge with direct stage views, a private pool, private bartenders/servers, access to an on-stage viewing area only for Super VIPs, a Super VIP concierge and camp access is also automatically included in the Super VIP ticket. Reserve: Assigned seating near the stage. No VIP amenities included. General Admission: Standing room only in the festival field, but you may bring your own blankets/chairs into designated areas inside the festival grounds. Allows for access to see all concerts, vendors, and activities. Student General Admission: Must have a hard, valid student ID (high school, college, or technical school – No transcripts, diplomas, etc will be accepted) to present at the gate upon entry. * All 4-day admission tickets have the option to add camp access onto the ticket, the ability to purchase camping or parking separately, and include access to all main stage concerts, sponsors and vendors. Admission tickets DO NOT include a campsite; they must be purchased separately. * In order to enter the campgrounds, you must have a 4-day admission ticket with camp access. Camp access grants you entry into the campground only; campsites must be purchased separately.